Time Magazine Archive collects the prominent weekly news magazine from its first issue in March 1923 through December 2000. The magazine conveys to a broad audience news and analysis on a spectrum of subjects. Try it today until May 26th. 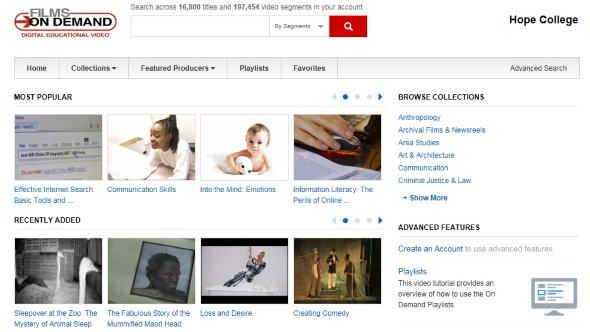 To search the archive, follow the on-campus or off-campus link and then select the Time Magazine Archive option. Life Magazine Archive collects the famed pho tojournalism magazine from its first issue in November 1936 through December 2000. The magazine featured story-telling through documentary photographs and informative captions. Each issue depicted international events, topical stories, and intimate views of real people. Try it today until May 26th. To search the archive, follow the on-campus or off-campus link and then select the Life Magazine Archive option. You can access these magazine archives we’re currently testing from our database trials page. Let us know what you think by giving us your feedback. What do you like or dislike about these databases? Did you forget your laptop? Want to avoid the computer labs? The library has five brand new Chromebooks available for checkout. Just ask for them at the second floor Media Services Desk. 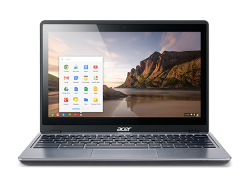 With a Chromebook, you can write papers in Google Docs, check email, search the library’s databases, watch cat videos, or do pretty much anything else you normally do in a web browser. These hot items can be borrowed for three hours at a time, so get yours now! 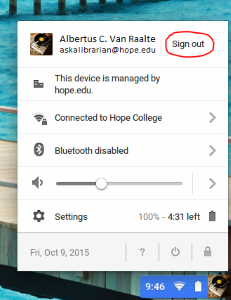 When you’re done using a Chromebook, be sure to sign out. You can either hold down the power button for 15 seconds or log out by clicking the toolbox in the lower right corner. 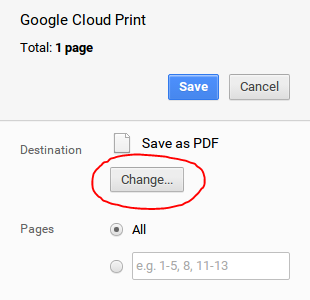 To print, type CTRL-P and then select either VWLIBCAT1 or VWLIB2ND2 as your destination printer. VWLIBCAT1 is located by the Research Help Desk on the first floor and VWLIB2ND2 is near the stairwell on the second floor.